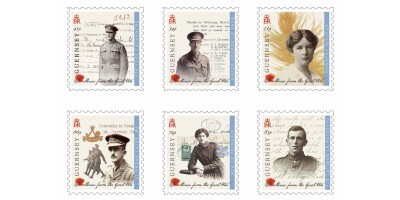 Stamp Descriptions 41p - Pte Yves Cataroche54p - Major George Le Page55p - Dorothy Nicolls66p - Lt Frank Laine74p - Ada Le Poidevin83p - Pte Latimer Le Poidevin Our sets are supplied in a robust gla.. There is a wealth of information throughout the text about this deeply emotive topic. 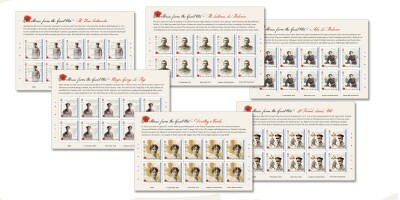 The stories about our six featured War Veterans are astonishing and brings the stamps to life. A beautifully put .. 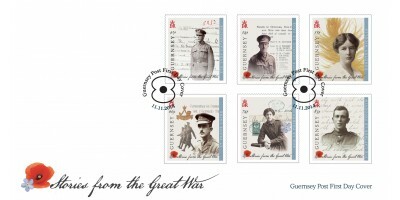 When Kitchener’s call to arms went up in 1914, Guernsey eagerly stepped forward. 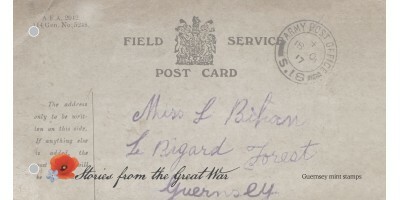 Amongst the first wave of volunteers were Private Yves Cataroche (41p) and Major George Le Page (54p). Bailiwick women also stepped forward to ‘do their bit’. In 1915, there was an appeal for Welfare Supervisors at the munitions factories. Dorothy Nicolls (55p) volunteered to join National Shell Filling Factory, No. 6 in Chilwell, Derbyshire. When the RGLI joined the front in September 1917, they did not have long to prepare for their first major battle, Cambrai. Friends, neighbours and families readied themselves to fight alongside each other and amongst them were Lt Frank de Mouilpied Lainé (66p) and his brother 2nd Lt Thomas de Jersey Lainé. Women also risked their lives in the war zones. The Salvation Army set up respite huts for soldiers, staffed by Salvation Army officers and small groups of ‘sisters’. One of these was Ada Le Poidevin (74p) who answered a call in the War Cry. Ada’s cousin, Private Latimer Le Poidevin (83p), fought alongside the Lainé brothers and Yves Cataroche. On his return, he set down his experiences in a remarkably accurate notebook and then never spoke of them again. The six individuals we have chosen to feature in this issue represent the hundreds of island men and women who stepped into the fray. 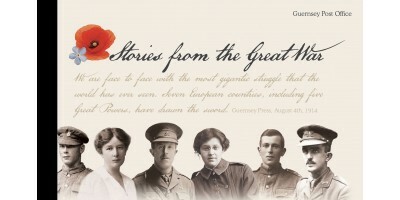 Over the next five years, we will tell their stories and show the impact the Great War had on the Bailiwick, as well as the significant contribution this little community made to the war effort.